In June 1938, a group of twelve Township residents got together and started the Upper St. Clair Volunteer Fire Department (VFD). After a fire at the St. Clair Country Club, insurance companies were going to double the fire insurance premiums of local residents because there was no organized fire protection in the Township. The VFD started in 1938 with $250 cash and no real property and was officially chartered as a non-profit corporation in November 1939. The Department purchased it’s first pumper in 1939 and housed it in a service station located at the corner of Rt. 19 and North Highland Road. The service station was owned by Ross Blodgett, one of the charter members. Later the department obtained the property across from Westminster Church and built the first fire station in 1949. This building had gone through several additions and renovations over the years until being replaced by the current main fire station. In 1975, the Township with the help of then state representative Michael Fisher obtained a parcel of land from the Commonwealth at the corner of Hastings Mill and Morton Roads on which to build a second fire station to better serve the southern area of the township. 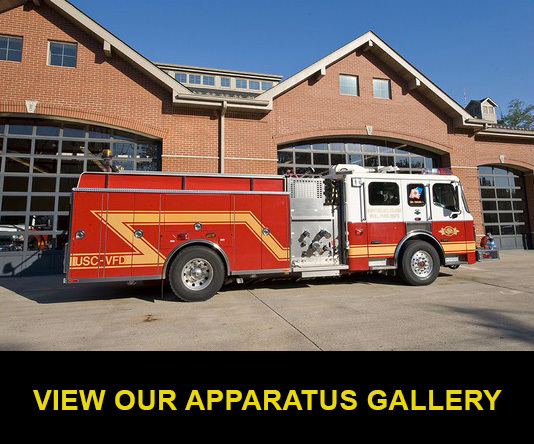 The Upper St. Clair Volunteer Fire Department has now grown from the original pumper purchased in 1939 to its current fleet of nine vehicles and two stations. Over the years, the Department’s membership has ranged from the original 12 members to a high of 50 members. The Ladies Auxiliary of the Volunteer Fire Department was started on October 10, 1940 to help with raising funds for equipment and supplies. According to notes of their first President, Nancy M. Young, taken from records of the Upper St. Clair Historical Society their “first money-making project was a bake sale from which we cleared $80.25.” In addition to the bake sales, they also sponsored bingo in the Fire Hall and fairs at the Clifton School Playground and marched in parades with the firemen. The Auxiliary disbanded during the war years, became active again in June 1948, and continued their activities through the late 1960s.